Variance Analysis: The monthly activity of comparing either/both of forecast/budget numbers with actual out-turn proved for me to be a really critical management task. It’s all about data for performance improvement. 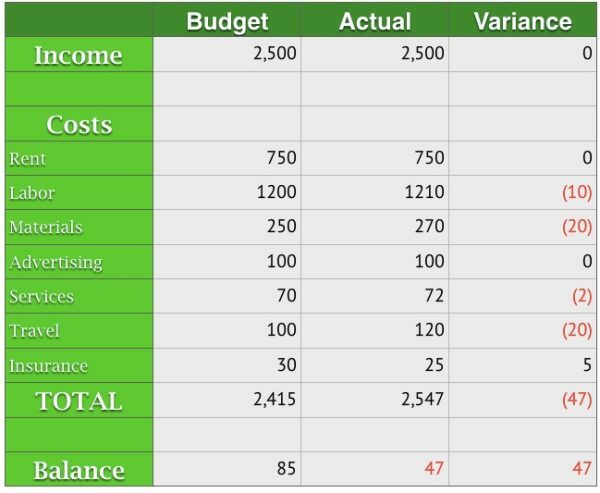 In my business, I used it mainly for two things: comparing sales forecast and actual sales, and budgeted profit/loss and actual numbers. We used variance analysis for more than simply comparing each month. We also used variance analysis for cumulative numbers during the accounting year. This was to guide us on actions that we could take to address the issue indicated by the variance, if it was negative. This kind of juggling was very helpful in reaching good conclusions in management meetings. The table below is very simplistic, but it will give you an idea of how to approach variance analysis. Of course your own situation will dictate which the factors are critical. You can add further sophistication if it’s helpful. For example, the percentage variance may be more revealing in your circumstance than raw numbers. You will probably want to do your variance analysis on a monthly comparative basis in order to see trends. Do NOT just leave the variance analysis to bookkeepers and accountants, though they will be instrumental in producing the data and maybe, even the charts. This is an essential management activity. Make sure that you analyze both the income and expenditure amounts: you can either raise the bridge or lower the water—or both. The Corporate Finance Institute has a simple and helpful discussion of variance analysis and on their page, you can also download a variance analysis template.